It would only take 15 minutes to swap out the used battery for a fully charged one. A recently filed patent may hint at Tesla’s plans for the future, specifically, how the company intends to provide Tesla owners with the ability to swap out battery packs. 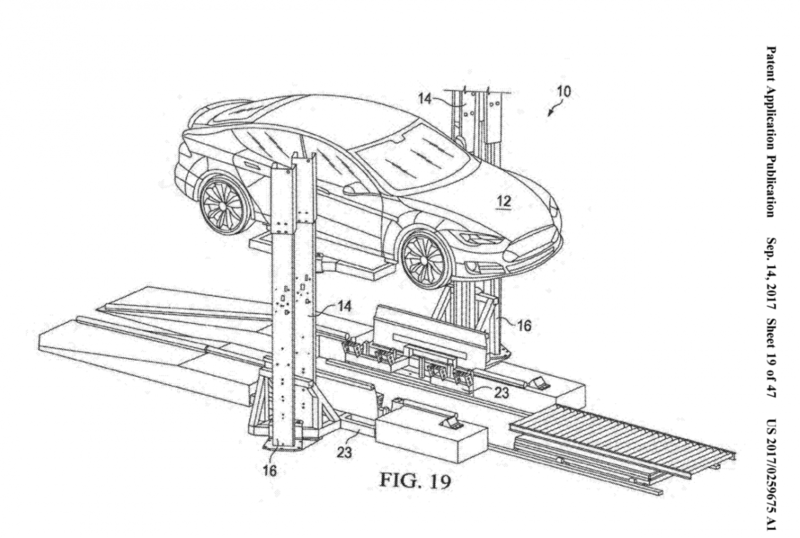 The patent, filed in May, details a battery swapping system in which a Model S or Model X would be driven onto a ramp or lift before being raised to a predetermined height. Technicians assigned to the station would then be able to assist with the machine’s operation and swap the battery for a fully charged one. From start to finish, the entire process would take about 15 minutes. Tesla is already expanding its supercharging stations to Boston, Chicago, and parts of South Australia. Typically, a recharge can take about 30 minutes, while the smaller charges coming to Chicago and Boston need 45-50 minutes. “This can provide a more rapid way of replenishing the electric energy for the electric vehicle and can enable electric vehicles to travel essentially nonstop on long road trips,” reads the patent. This isn’t the first time Tesla has considered introducing battery swapping stations. In 2014, the company launched a pilot program that would allow people to swap their car’s battery in about three minutes, but it required an appointment to be made beforehand. At the time, Tesla believed future iterations of the service would take less than a minute, as the process became more automated. TechCrunch notes that, despite the patent only mentioning the Model S and Model X, the stations could be of benefit to other Tesla vehicles, too. The company’s self-driving semi truck, set to be officially revealed on October 26, would be one model that would certainly benefit from being able to have its battery exchanged mid-trip. If the battery swapping system is truly faster than a supercharging station, it could also reduce the semi’s own travel time. The existence of the patent doesn’t mean Tesla has plans to work on the project, however. We’ll have to wait and see if the company thinks it’s worthwhile to pursue.